While many business schools focus on teaching their students with theoretical case studies on large multi-national corporations, the Busch School of Business at Catholic University is giving its students hands-on experiences growing small local businesses. Entrepreneurship 491 is a part of the Busch School’s campaign to use their academic resources to impact Brookland’s burgeoning small businesses. The Ciocca Center for Principled Entrepreneurship at the Busch School has also been partnering with local small businesses to offer resources. “In my years of schooling I’ve only ever read and learned about large Fortune 500 companies but didn’t get any insight to the trials and tribulations that small but passionate entrepreneurs go through and how they overcome them,” senior marketing-major Liam Darcy said. Darcy is one of 10 Catholic University seniors participating in Entrepreneurship 491: Small Business Growth Lab, a class that gives its students experience consulting with small businesses. “We need to go out into our local community and find those businesses and nurture them and care for them and give them the resources that the university has to offer to them,” Michael Hernandez, the professor teaching Entrepreneurship 491 said. For Hernandez, 23, this course has been a way to marry his passion for small business with his ties to Catholic University. Hernandez graduated from Catholic University in 2017 and accepted a position with the Ciocca Center for Principled Entrepreneurship at the Busch School. In the fall semester, students participate in the Boston-based Initiative for a Competitive Inner City’s small business development program. Harvard Business School professor Michael Porter founded the Initiative for a Competitive Inner City to develop the potential of small businesses in American inner cities. “Small businesses are always reinvesting in the lives of their workers and are reinvesting in their communities,” Steve Grossman, president of the Initiative for a Competitive Inner City, said. Grossman said that small businesses create most new jobs in America. According to a 2017 Sageworks data release, small businesses are responsible for three-fifths of net new jobs which makes them essential in working against poverty. Grossman has been advising the Catholic University students as they go through the Inner City Capital Connections initiative. He and the Initiative for a Competitive Inner City have collaborated with the Busch School to host several events this fall that bring together local entrepreneurs and Hernandez’s students. Catholic University is the first university to partner with the Initiative for a Competitive Inner City to extend its initiative with college student involvement. 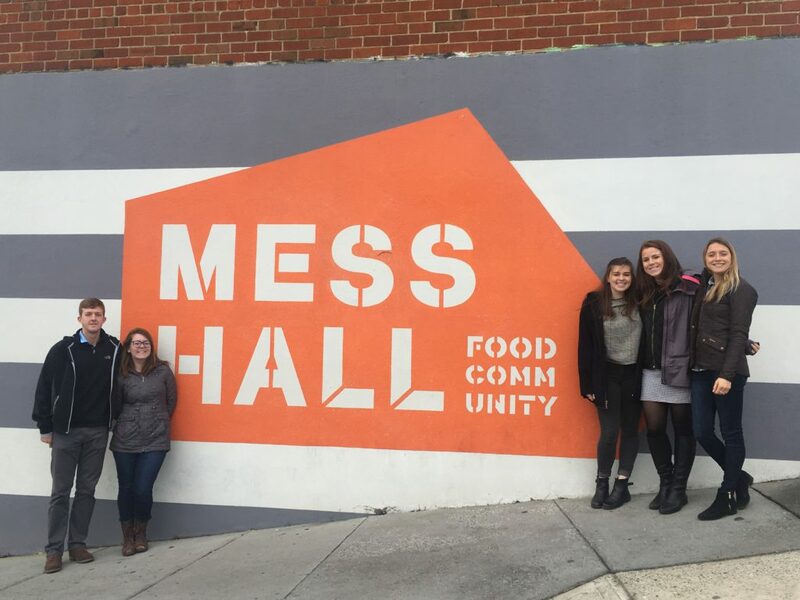 In the second semester, students consult with Mess Hall, a Brookland-based food incubator with 30 member food-based businesses such as Junius Coffee and Sweet Crimes. The partnership between the Busch School and Mess Hall started in spring 2018 after Mess Hall participated in the Inner City Capital Connections initiative. Students work with Mess Hall and its members to grow their businesses while gaining real-world experiences. Mess Hall’s leadership, organizational structure, and proximity to Catholic University make it a strong strategic partner for the Small Business Growth Lab. For Hernandez, being able to walk only several blocks to Mess Hall makes the opportunities his students have even more important. Through the course students experiment with possible industries they would like to work in or with skills they would like to develop. One student is starting a gelato business. A second student is creating a comparative assessment of local food incubators. A third student is creating a food allergy menu consulting business. These students are applying what they have learned in college to work that feels natural to them and that promotes human flourishing. Hernandez uses his small business connections in Washington D.C. to connect students with industry professionals and businesses in which students can try out different career paths and discover what they are passionate about. “I’m able to say to whoever is in the class ‘what do you want to do?’ and I can find a project for them,” Hernandez said. Finding opportunities for his students’ passions is especially important to Hernandez because of changing job patterns. Historically, Americans held fewer jobs for longer periods of time. In recent years, younger Americans held more jobs for shorter periods of time. Hernandez said this is why it is important for his students to know what kinds of work they are called to. Whether it is working with small businesses or working on passion projects, Entrepreneurship 491 is an innovative course that benefits the local Brookland community while launching its students into careers where they will flourish in meaningful work. “We want to find out what that is for you and enable you and give you opportunities to show the world all the possibilities you bring to it,” Hernandez said.